Working in pastel, acrylic and fabric, Ginny Abblett has studied art and worked on location in the United States, Europe and Asia. An artist since childhood, she studied art and education in college, with her art providing balance in her demanding teaching career. Ginny's artwork has earned numerous awards; she teaches privately and with groups, and demonstrtes her art for a wide a variety of groups including the Denver Art Museum. Abblett’s paintings amd textile creations are in public and private collections throughout the United States, Europe, and Asia. She presently is represented by Garden and Soul, Country Furnishings of Taos, and Wabi Sabi in Taos, New Mexico and Ginny Abblett Fine Art on Santa Fe Drive in Denver, Colorado. 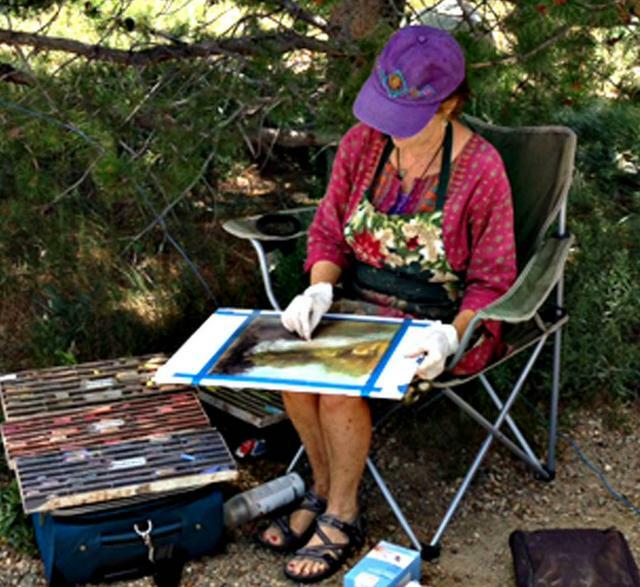 Ginny presently has a studio at Nine10Artists in Denver and a casita in Taos, New Mexico, where she makes art and breathes in the New Mexico air.